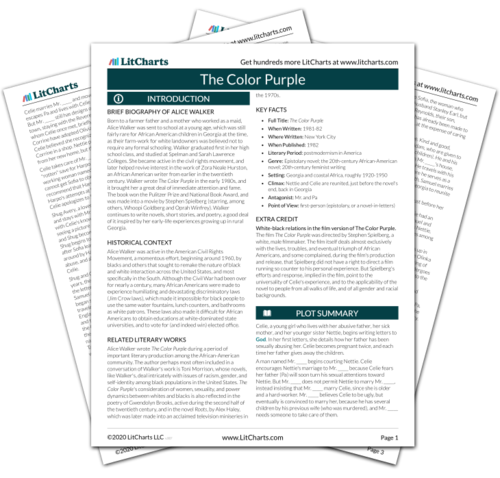 Instant downloads of all 942 LitChart PDFs (including The Color Purple). 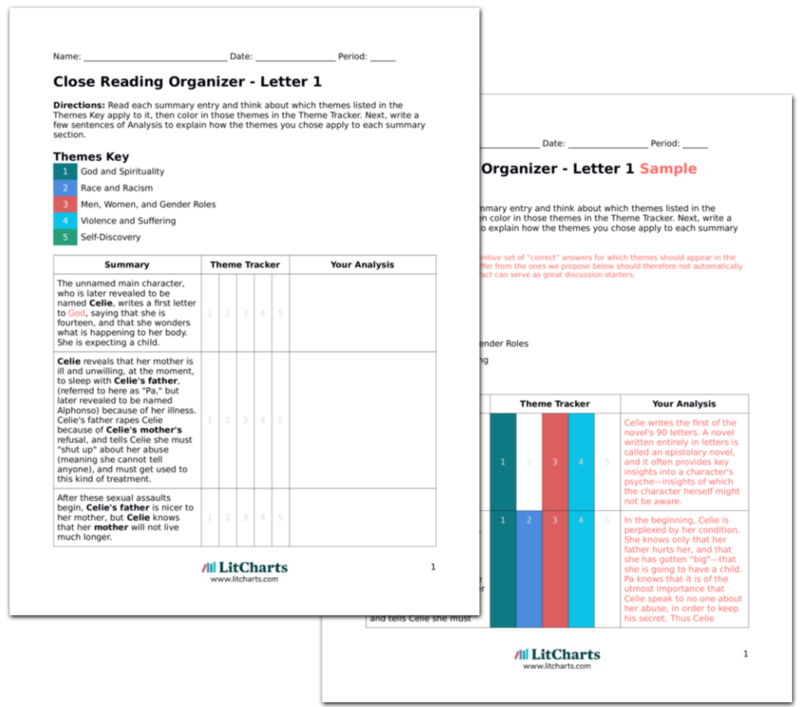 LitCharts assigns a color and icon to each theme in The Color Purple, which you can use to track the themes throughout the work. Harpo's jukejoint opens several weeks later, with Swain playing some songs on weekends, but there are very few customers in the beginning. Shug, whose nickname is the Queen Honeybee, comes down from Celie's house to check out the bar, and Mr. ____, Harpo, and Swain agree to book Shug for a few shows there. Shug has been slowly on the mend in the intervening chapters. Although it appeared that Shug was going to die, earlier in the novel, Celie believes that Shug is too strong, and too stubborn, to give up the ghost easily. Shug prepares to sing one night, and Celie and Mr. ____ accompany her to the bar, despite Mr. ____'s protestations that Celie should not be allowed in an establishment like that, since it's "no place for wives." Shug says she needs Celie there, however, so Celie is ultimately permitted by Mr. ____ to go. Shug's decisions regarding Celie tend to override Mr. ____'s. This will be repeated later on in the novel, when Shug demands that she be allowed to sleep with Celie every night, and Mr. ____ agrees. Shug sings a few songs, much to Celie's delight. But Celie enjoys looking at Shug so much, she grows confused and starts to cry: she loves looking at Shug, but Shug only wants to look at Mr. ____. Then Shug sings a song she dedicates to Celie—the "dirty" song she began composing while Celie was combing her hair—and Celie feels a surge of happiness. All Celie wants is to be recognized as a person—as a friend, as a supporter of Shug's. Shug, at this point in the novel, seems to acknowledge just how much Celie has done for her. Shug also feels a pang of guilt for being cruel to Celie immediately after meeting her. Schlegel, Chris. "The Color Purple Letter 33." LitCharts. LitCharts LLC, 20 Nov 2013. Web. 22 Apr 2019. Schlegel, Chris. "The Color Purple Letter 33." LitCharts LLC, November 20, 2013. Retrieved April 22, 2019. https://www.litcharts.com/lit/the-color-purple/letter-33.